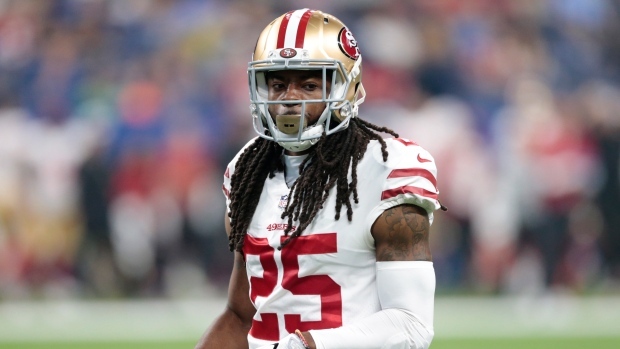 SANTA CLARA, Calif. — When it comes to stopping opposing offences from moving the ball, the San Francisco 49ers defence has fared all right early this season. But a defence that has generated a league-low three takeaways for the fewest total for the franchise after five games since 1977 is a major reason why. "We just have to find a way, that's all it comes down to," cornerback Richard Sherman said. "Takeaways are kind of more of a ball bounces your way, you get tips sometimes. Last week, we limited them pretty good. We have to be more violent in tackling and can't miss when the quarterback throws into coverage." The team has generated no turnovers in the 113 plays on defence since then. "We've had our opportunities this year," defensive co-ordinator Robert Saleh said. "There's an old cliche saying that, 'Catch the ones that are thrown to you.' We've had our opportunities, especially early in the year where I think we've dropped about three or four interceptions this year. We've gotten the ball out. We're taking shots at the ball. There's great intent. Takeaways come in bunches, they do. ... I know it's a result-oriented business, but the result is a product of the process that you go through within every play, within every day. If we keep attacking the ball the way we have and the D-Line keeps pressing the pocket and getting after the quarterback, I'm very confident that eventually they'll come." Instead, Cardinals rookie Josh Rosen targeted Christian Kirk deep and the play turned into a 75-yard touchdown because cornerback Ahkello Witherspoon didn't have the deep help he expected from Colbert on the play. The Cardinals gained just 145 yards the rest of the game but it proved to be enough in a 28-18 victory, especially because the defence provided no short fields for the offence, which began each of its 13 drives inside San Francisco's 40-yard line. "When people feel like they need to do more than what they're being asked to do, that's when bad things actually happen," Saleh said. "Right now, that first play, and A.C. will tell you, he'd love to have that play back, but the way they responded after that play and the way they came out and played and executed the defence all the way through, I thought was really good on their part to remain composed and to continue to fight all the way through the game."